Put simply, Tel Aviv is where the action is in Israel. The beaches are clean and fulll of white sand, the sea enticing, the nightclubs hopping, the shopping plentiful and the restaurants appetizing. During the day, stroll down the boardwalk-style promenade or on the beach itself. At dusk, catch the nightlife scene along Dizengoff Street. Meet up at the sculpture fountain created by the acclaimed Israeli artist Yaacov Agam and go to a club, or just hang out and people-watch from an outdoor cafe. 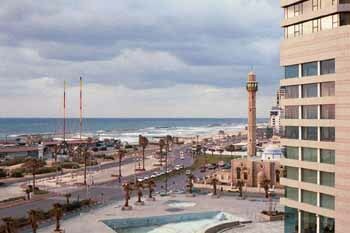 Tel Aviv is also a good base for exploring the northern and southern Mediterranean coasts. 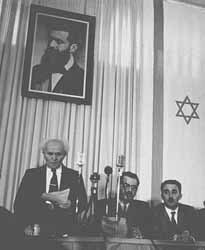 When Tel Aviv was established, it was the first all-Jewish city in modern times. Originally named Ahuzat Bayit, it was founded by 60 families in 1909 as a Jewish neighborhood near Jaffa. In 1910, the name was changed to Tel Aviv, meaning “hill of spring.” The name was taken from Ezekiel 3:15, “...and I came to the exiles at Tel Aviv,” and from a reference in Herzl’s novel Altneuland, in which he foresaw the future Jewish state as a socialist utopia. Because Jerusalem was occupied by Jordan after Israel became an independent state in 1948, the temporary capital and home of the government offices was in Tel Aviv. Several government offices remain there and Tel Aviv is still home to foreign diplomats from countries (now excluding the U.S.) that don’t recognize Jerusalem as Israel’s capital. Today, Tel Aviv is Israel’s second largest city (after Jerusalem), with a population of 380,000, and among the big city problems it shares is traffic congestion. Things are more spread out in Tel Aviv than the smaller cities, but it’s still often easier -- and faster -- to travel by foot. Walk along the Orange Routes, for example, to get acquainted with the city. Though much of the city is a drab gray, many buildings, especially along Rothschild Boulevard, actually have an interesting architectural pedigree that can be traced to the Bauhaus architecture of pre-Nazi Germany. There are more than 5,000 Bauhaus buildings, the largest number in any one city in the world. In fact, the city’s “outstanding universal value” led UNESCO to recognize it as a “World Heritage Site.” Tel Aviv is also known as, “The white city”, named so in account of the the bright colors of the building style: white, off-white, light yellow. There are over 1,500 buildings marked for historic conservation in Tel Aviv. Fifty percent of the polished diamonds in the world come from Israel. 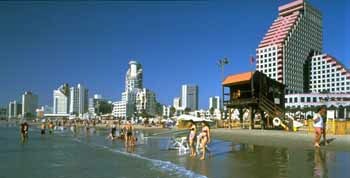 Tel Aviv is the country’s business and cultural center. The Tel Aviv Stock Exchange, founded in 1953, and the Diamond Exchange, are two of major economic institutions in the city. For the arts, the Habima National Theater is excellent and the Israel Philharmonic Orchestra is world-class. The city also boasts several impressive museums and a top-flight university. Though no Sears Tower or Empire State Building, the Azrieli Tower is the city’s tallest building, at 614 feet (the tallest in the country is Migdal Shaar Ayir in nearby Ramat Gan at 801 feet). Before the Observation Floor was opened to the public, Israel’s highest observation deck was the 433-foot-high rooftop of the Shalom Meir Tower, which had been Israel’s tallest building for 34 years. Due to terrorism threats, the Azrieli Towers’ mall, one of the busiest in Israel, is probably the world’s most secure shopping center. In addition to Dizengoff, other streets filled with shops, galleries and restaurants worth strolling are Allenby and Ben Yehuda streets. 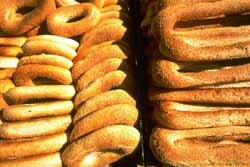 Off Rehov HaCarmel, for example, you’ll find an open-air market. If you walk north from Jaffa down the seashore for about an hour, you’ll reach the Tel Aviv port (Namal), a hip area of restaurants and clubs around the intersection of Dizengoff and Yirmiyahu streets. The Tel Aviv Museum on Sderot Shaul Hamelekh is home to magnificent works of art, particularly sculpture and paintings by local artists. Another popular museum is the home of Israel’s national poet Hayyim Nahman Bialik. A small, less visited museum is devoted to Nahum Gutman, one of Israel’s most well-known artists. David Ben-Gurion’s home in the center of Tel Aviv has also been turned into a museum. The modest digs are impressive because they show the simple way the country’s most powerful politician lived. Besides a collection of awards and gifts assembled in the house, his awesome library of 20,000 volumes remains intact, filling much of the upper floor of the house and testifying to the man’s thirst for knowledge. A less well known museum is the Haganah Museum on Sderot Rothschild. It was set up in the apartment of the founder of the Haganah, Eliyahu Golomb. Despite being one of the most wanted men in Palestine, the British never found Golomb’s home. Additions to the building now house collections of weapons and exhibits on the struggle for independence. One can't miss attraction is Beth Hatefutsoth, the Museum of the Diaspora, on the campus of Tel Aviv University. 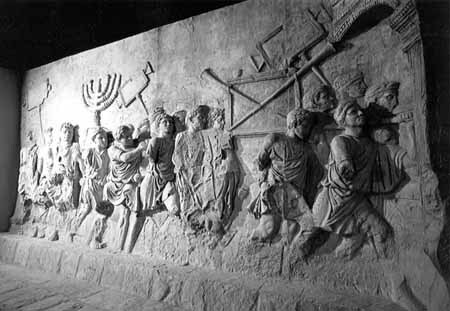 It contains exhibits on the history of the Jewish people covering more than 2,500 years. The University itself is also a nice place to visit and a popular destination for foreign students spending time studying in Israel. Tel Aviv University is in the suburb of Ramat Aviv. Another academic institution, Bar-Ilan University is in the suburb of Ramat Gan. Some of the other well-known neighborhoods in Tel Aviv include the Orthodox enclave of Bnei Brak, the “Beverly Hills” of Israel, Savyon, and one Israel’s earliest modern settlements, Petah Tikvah, which was founded in 1878. Another can’t miss museum, perhaps the most moving in Israel, is the Palmach Museum. You need a reservation, but it’s well worth it. Instead of walking through halls of exhibits, you follow a group of Palmachniks as they tell the story of their experiences during the fight for independence. The beautiful area of Neve Tzedek (Oasis of Justice) was actually the first neighborhood of Tel Aviv. It was established in 1887 on land that belonged to a political activist named Aaron Shlush. You can still see his house as well as other old buildings representative of the architecture of the early days of settlement in Israel. Don't miss the Suzanne Dellal Center for dance and theater, the home of the world famous BatSheva Dance Company. Neve Tzedek is the home of many artists whose works are displayed throughout the area. Pull up a chair at a sidewalk cafe and relax before continuing your tour. A few minutes walk from Neve Tzedek is the IDF museum. This is a collection of building that have exhibits on various IDF units, commanders and weapons. If you're interested in firearms, this is the place for you. Next door is “The Station,” another place to shop and eat built the site of the first train station ever built in the Middle East in 1892. Replacing camels, the train took people and freight on the 35 mile journey from Jaffa to Jerusalem in just six hours. The station was not used after 1948 and was left in disrepair until opening as a museum and entertainment complex in 2010. Jaffa has been a fortified port city overlooking the Mediterranean Sea for more than 4,000 years. It is one of the world’s most ancient towns. It has been the target of conquerors throughout the ages because of its strategic locations between Asia, Africa and Europe. According to the Bible, Jonah left from Jaffa on his fateful voyage before encountering the whale. Christians learn hat St. Peter miraculously restored life to Tabitha in Jaffa. Up until the early 20th century, when visitors came to Palestine, they usually arrived in Jaffa. The coast there is too rocky for ships to land, so they usually had to anchor offshore and send their passengers to the port in longboats and dinghies. Today, Jaffa is a popular tourist destination because of its beautifully restored old quarter filled with galleries, shops and restaurants. One of the few religious sites is the house of Simon the Tanner, where, according to the New Testament, Peter first realized the gospel message had to be extended beyond the confines of Judaism. You can walk from Tel Aviv, but it’s a good 40 minutes, and once you get past the strip of hotels not as well-trafficked, especially at night. The easiest spot to locate is Hagana Square where the clock tower stands. It was built in 1906 by the Turkish Sultan, Abdul Hamid II, to commemorate his 30th anniversary as ruler. If you head toward the minaret towering over the Mahmoudiya Mosque, you'll find yourself in a Middle Eastern buffet, with cafes and kiosks selling all of the region's delicacies. The Visitors’ Center in Kedumim Square has exhibits of archaeological remains and the history of Jaffa. The square is a good place to sit and have a picnic and people watch. At night, bands often play here. The streets off the square are lined with shops, nightclubs and cafes.